I am just about done with the design of the trucks for the Presidential Car, United States. It took more than seven iterations to get the design right. I still need to add the brake linkage, the bottom bar under the pedestals. Once I have two trucks complete I will work on the trundle truss that connects the two trucks. I went with black and gold paint scheme, as red wheels that some others have used seemed out of place on a funeral car. I have started work on a 1/32nd scale model of the United States. 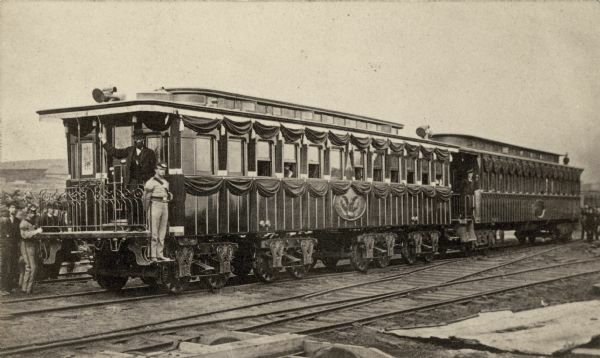 This was a unique passenger car built in Alexandria, Virginia to serve as the Presidential car. The car took about 18 months to build and was complete in 1865. President Lincoln never rode in the car when he was alive. However, it was was used to transport the bodies of he and his son for their final interment in Illinois. The story of the funeral is well documented in various locations such as here and here. This model will go on display in th B&O Museum as part of their last year of the "War Came by Train" series. The car no longer exists, and no official plans for the car survived. 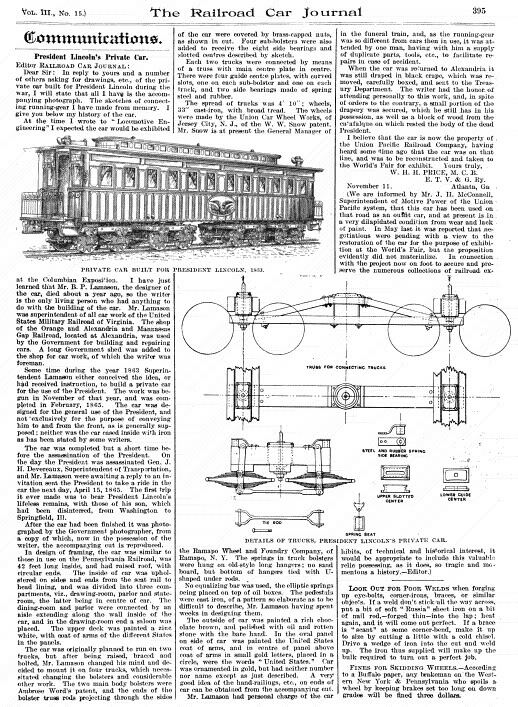 The best period description of the car construction was in Railroad Car Journal (Volume III, December 1893, Page 395) by W.H. Price. This source provides a sketch of the unique double truck arrangement used by the car. However, the drawing cannot be correct in all details as the angled truss element as shown would interfere with the interior brake beams of the trucks. The drawing also is not to scale as the overall wheelbase in the diagram is much greater than shown in photos. Model Railroader published a set of plans for the car about a dozen years ago. The plans were largely based on research by Dr. Wayne Wesolowski. Wayne is a well known to model railroaders and others as a custom model builder. He has built 3 copies of the United States, and several copies of the engine Nashville in 1/12th scale. They are on display at museums across the United States. I got to know Wayne about 12 years ago when we jointly participated in an exhibit of civil war railroad models at the Lyceum, Alexandria's City History Museum. He has graciously been providing me with information and plans for the United States. Wayne has spent many years chasing down surviving pieces of the car. He also worked with historic railroad experts to develop plans for the construction details based on best practice at the time. Based on information he has provided, I am working on the 1/32nd scale model. Using the Model Railroader plan as a base, I drew this plan in color. This plan will be used to develop the laser cut parts I intend to make. I started construction with the trucks as I reasoned they would be the trickiest part of the project, but the decorative trim is also going to be very challenging. The trucks are a swing motion design. If you are not familiar with swing motion design, this page has a good description. There are elliptical springs both transverse for the swing arm and lateral inside the pedestal. The pedestals have a very intricate design. Even the journal cap has decorative flourish that appears to be a man on horseback, or perhaps a rearing lion. The two trucks are connected via a truss beam to a central drum called a trundle. The trundle is the pivot point that connects to the usual bolster. Price's description mentions a Ward patent bolster. Drawings of that are available, but it will be largely hidden when the car is assembled. 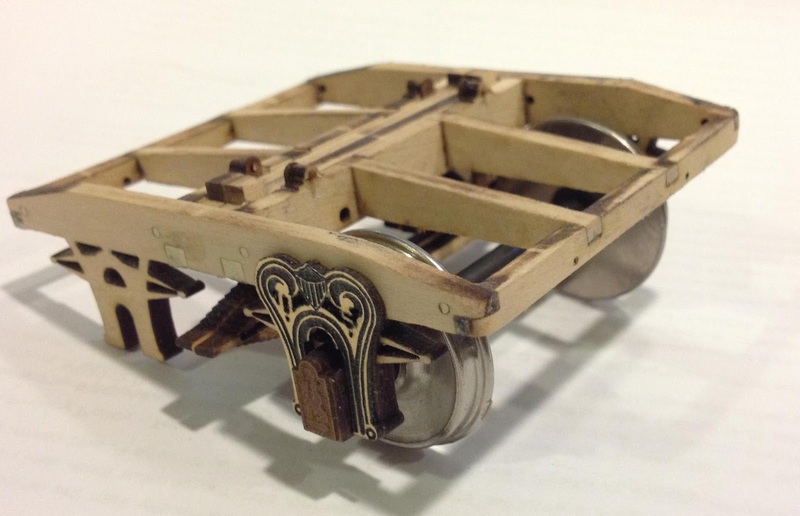 The trucks have pins that connect to the car that ride in curved slots, similar to the way a pony truck rides under the firebox of more modern steam engines. Wayne's plans for the truss show a single wood beam with iron truss rods providing stiffness. The image at the left is the second test model at designing the laser-cut bolster. The main frame is 1/8th basswood. Wayne's plans called for 3 inch members, but they looked too flimsy to me when I made the first test model. So I bumped up to 4" (1/8th inch basswood) for the main members. To simplify construction I am incorporating some details integral to the laser cut assemblies. For example the transverse elliptical springs are integral to the bolster instead of making them as separate parts. The pillow blocks on the truck bolster beams are integral to the beam. Even with these compromises, the truck suspension will function almost as originally designed - a moot point as this is a static model. I ordered additional wheel sets from NWSL. In the meantime, I am using the one wheel set I have on hand to test fit, etc. Note the actual car had compromise wheels to allow running on different gauge track. Thus I ordered the 236 wide wheel treads from NWSL. The set shown here has 172 tread. The pedestals are three layers. The bottom layer is integral to the truck side frame. This is the same design I use on my HO and O scale trucks. On this truck, the top layer is laser engravable plastic with a thin layer of gold over black. It is normally used to cut name plates and similar items for trophies etc. It can be very tricky to cut fine detail in it. You have to experiment with the laser settings to get the right power, speed and frequency without melting the parts. Even in 1/32 scale the engraving on the trucks is so fine that it almost disappears. The laser dot size is about 0.005 inches, so any detail smaller than that is hard to capture. Next step is to add the brake details and all the truss rods and NBWs. Chase and Danica play with "Hidden Valley,"
I do recall seeing John Allen’s layout in Model Railroader at the public library when I was in high school, but the person that influenced me most to get into model railroading was my son Chase. He loved trains when he was a kid and he infected me. My dad claimed some credit as he built an HO layout for my twin brother and I when we were about 6. So I guess Dad planted the seed, but Chase got it growing. Prior to Chase and I building a layout together, I really was not that interested in trains. In fact, I had a job offer when I got out of the Army in 1984 from GE Locomotive Group to do thermodynamic modeling of their prime mover diesel engines. That would have tied directly with my master thesis work entitled, "Thermodynamic Modeling of Engine Knock based on End Gas Temperature and Pressure." This was the time period when GE had converted their locomotive factory to robotics. I got a tour of the robotic assembly plant. It was an interesting juxtaposition of a brick steam era facility with modern robots moving about. But I took a job in the defense industry instead as I thought at the time that, "trains are boring." Hah! Little did I know! I built a couple layouts for Chase, and then Danica when she came along. I had such fun building them for the kids, that I built an NTRAK module for myself. 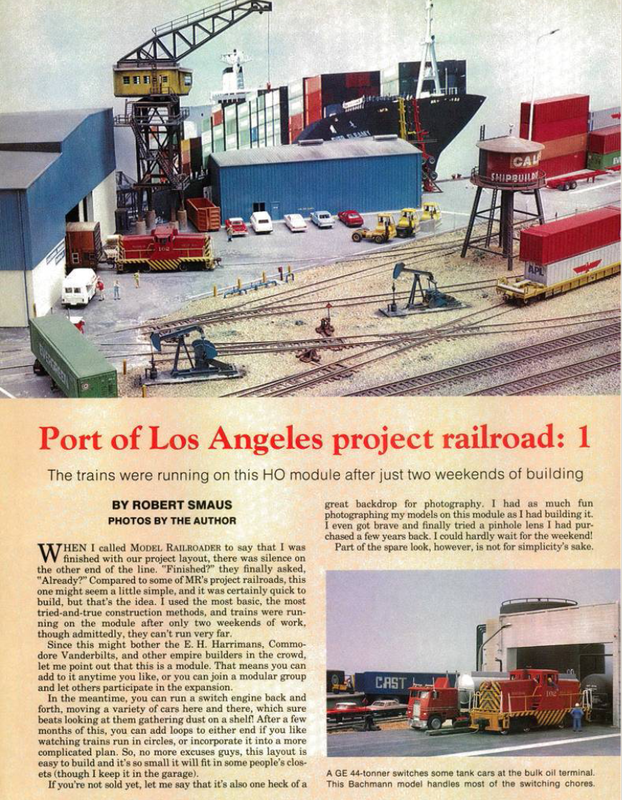 That module was heavily influenced by Bob Smaus’ Port of Los Angeles module in Model Railroader in the early 1990s. My module was called Chase Marine Terminal. 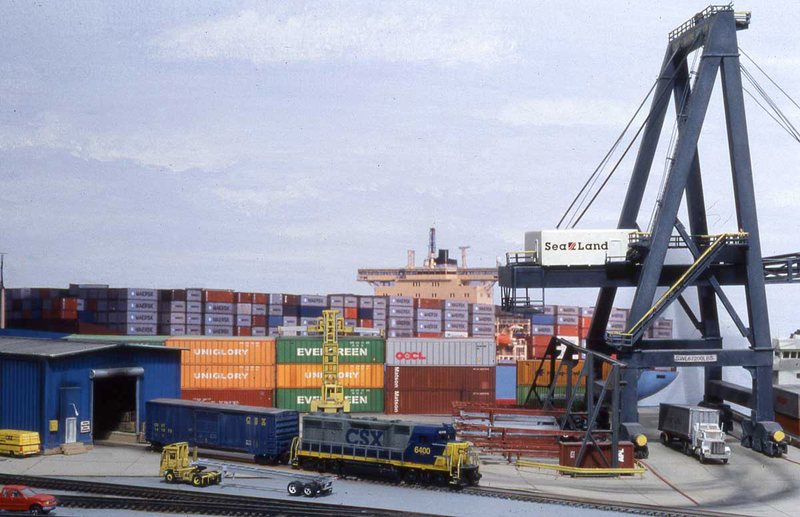 It was a 2x4 NTRAK module with an 18 inch long container ship and a Paceco 40-Ton container crane. Both models were scratch built. I got rid of the module, but I kept those two models. I still have them. I built a second Chase Marine Terminal as a part of a home layout in the mid 1990s. And I have plans for a third one at some point. My first NTRAK module, "Chase Marine Terminal." John Hill and Matt Schaefer were both good friends that had a big influence on my modeling. John is well known as a war-game designer (Squad Leader and Johnny Reb are two of his most famous games). He is one of the most astute military analysts I have known. But he is also a fine model railroader and model builder. He excels at designing scenery for war games. We had many great times researching and building scenery for massive - 40 plus player - miniature war-games in the late 1980s. He is introducing a new civil war game to be published by Osprey Publishing at the 2014 Historicon Convention this weekend. Matt was a great friend who introduced me to the C&O. We spent many a late night building joint projects, usually C&O related. We also did a lot of photography together. Alas, he passed away about 4 years ago. I, and many of our mutual friends, really miss him. The hot steamy weather has descended on Virginia with a vengeance. Usually this is perfect weather to escape to the cool basement and work on the layout. Alas, many other demands on my time have prevented much work on the layout. But there is some news to report, some of it even ACW related. To escape the heat, we headed to Park City, Utah for a long July 4th weekend of golf and R&R. I managed to sneak in an op session at Rob Spangler's gorgeous HO Western Pacific layout in Syracuse, UT. This is Rob's third layout, and possibly his biggest yet. The layout has a great operations scheme, single track, time table and train order operation with telephone communication to the dispatcher. While Rob's layout is very well done in all respects, he is really famous for his backdrop painting and scenery. I also visited the Heber Valley Railroad after a round of golf at the Homestead course in Midway, UT. The RR runs regular excursions down Provo Canyon. They have two diesel engines in current service and steam engines under restoration that are due to be ready next year. This engine will not run again, but the Heber Valley RR uses it as a "billboard." Back in Virginny, I am building some custom models for clients. 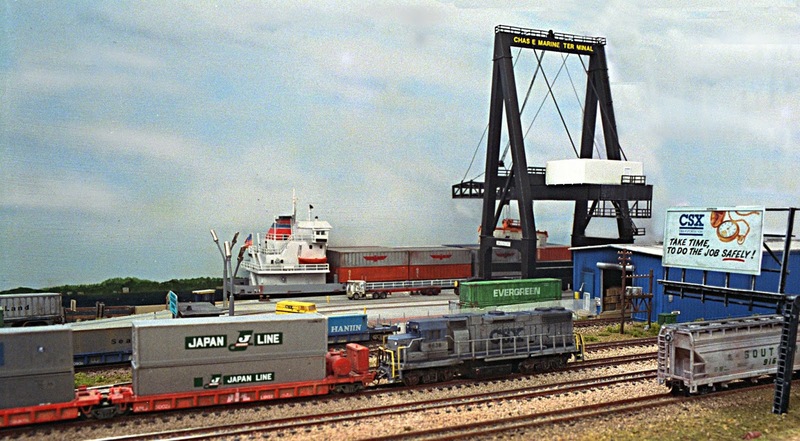 The first is the Thurmond coal dock in HO scale. I built one last year for a client in NJ. Now, a second model is underway for a client in Michigan. I also plan to offer this as a limited run Alkem Scale Models kit. It is nearly ready but I need to get the instruction manual complete. Believe it or not, making the instruction manual is about as time consuming as designing the kit. I am also in the process of building a model of the Chattanooga Train shed in HO. That project is on hold awaiting some feedback from the client. Another major project is scratch building a model of the Lincoln Funeral Passenger car in 1/32nd scale. This will be for the B&O Museum for their 2015 The War Came by Train display. On the USMRR Aquia Line, I have had a couple groups of visitors in the past month. Dale Lantham and his regular operations group stopped by for a look at the layout. Dale has a fantastic HO layout that was featured in Great Model Railroads a few years back. Afterwards, Ron Schmidt, one of the visitors, offered to give me a telegraph sounder. I had mentioned to them my plan to add telegraph to the layout and he generously offered it. More on that later. Yesterday, Rich Kohr escorted a group of 4 other Gettysburg Licensed Battlefield Guides to see the layout. They had a great time and stayed for several hours, even though they did not want to try running the trains. I think some of them were inspired to try some ACW modeling on their own. That would be great. Mike Kanazawich has a book about stories relating to the Lincoln's assassination. You can order it here. Today, I was in southern PA and had a chance to visit the Steam into History train in New Freedom, PA. I arrived there in time to catch the 11:00AM train. Alas, it was annulled. The next train was due to leave in 2 hours, but I could not hang around for that. So I got a couple snapshots of the train in its pen and headed home. I drove along a parallel road to the tracks on my way into town. The terrain that the railroad runs through is very pretty but heavily forested and hilly. It looks like it would be hard to find decent spots in summertime to get good shots of the train in motion due to the trees. I have been thinking about adding telegraph communications to the layout. I was unsure how to do it. My thinking was that the telegraph would just be a sound effect. I recently acquired a railroad morse sounder from Ron Schmidt. I was planning on using it to create sounds of the actual messages that the dispatcher wrote. The dispatcher would type the messages into a computer that would translate it to railroad morse code. The sounder would play the message. Since I do not plan to have an operator position on the layout, the dispatcher would carry a hand written copy of the message to the appropriate station on the railroad. I hadn't quite figured out the OS side, as I didn’t think I wanted the conductors typing messages, a job that the operator would normally do. One oddity on my layout is that all trains stop at all stations to check for orders. They did not use train order boards in my time period. However, thanks to an interesting on-line discussion with Trevor Marshall and his friend Skip Luke, I learned about the simplified US Military Telegraph Dot Code. You can learn more about dot code at this web site. Armed with this information, I think a simplified telegraph system and code can be used to send OS messages. The telegraph OS will help keep the conductor/brakeman busy. I need two man crews for my short trains as the brakeman needs two hands to operate the link and pin couplers, while the engineer operates the throttle and whistle (there are a lot of whistle signals). The conductor/barkeman will also handle the couplers, TT&TO, switch lists and telegraph dispatching. More on this as it develops. 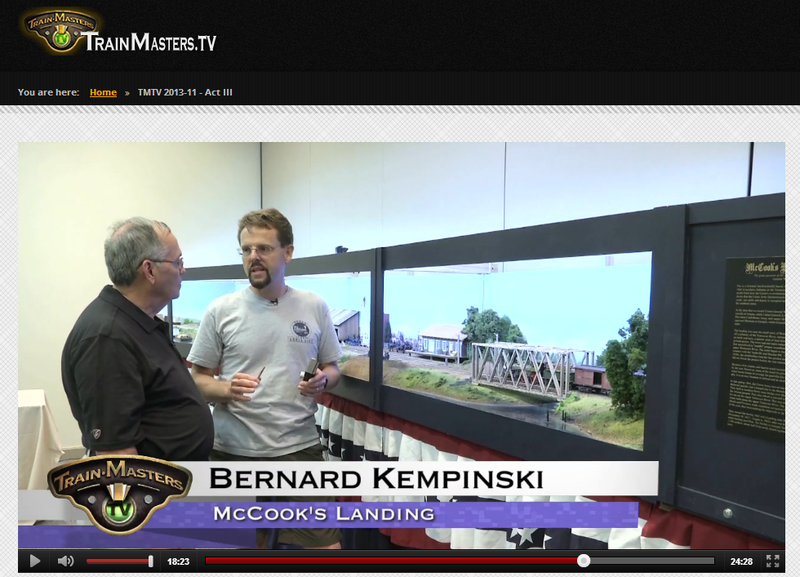 Trainmasters.TV has posted the video they shot of McCook's Landing at the Atlanta NMRA show as part of one of their free sample videos. Click on this link and go to the 18 minute mark to see some nice professional video of the McCook's Landing layout. If you like it, I am sure they would appreciate if you sign up.